Sorry for the lack of an update last week - I was in Melbourne and there wasn't a whole lot of board gaming to report on..
Dream Home - Dream Home wins on aesthetics alone. With bright, colourful, charming and endearing art work combined with a theme about building a dream home that everyone can relate to - how could you not love this game? Mix in simple but fun mechanics and most players will easily be able to enjoy a round or two of one of my newest games in my library. Those looking for depth won't really find it here and I can imagine with multiple plays Dream Home will wear a bit thin, but regardless its an excellent game to have in the collection if you can afford the luxury to have a game just to please the masses. That's not to say that I don't enjoy it, because I certainly do. But after four plays I've tried what I've wanted to with Dream Home and will most likely just use this game to lure others into the hobby. Which of course means it'll see a fair few more plays to come..
Dominion - A few more plays this week of a game that has possibly snuck into my top 10 games. As I'd mentioned before, this is the first and only deck builder I've ever played but with how much I'm enjoying Dominion, I really don't feel the need to venture to other deck building games. It's easy to play and teach, but the possibilities seem nearly endless. We've just been playing through all the preset kingdom cards as per the manual and haven't even felt enticed into trying Intrigue yet (which came in the big box). There's still so much to do and I don't feel like I've really mastered any sort of strategy. As a matter of fact I'd go as far as to saying I'm pretty ordinary at this game and lose just as much as I win. But win or lose, its just so fun. We all start the same, we all have the same cards to add into our decks and yet our decks are all so different by the end of the game. The design is genius and if I ever feel things are getting stale I know there's a heap more expansions to explore so I can imagine my deck building will comfortably sit with Dominion for the next little while. Shelves - Shelves!! Finally!! Since I've been growing the library, all my games have been relegated to the closet, hidden away where no one can see. This clearly is a problem as whats half of the beauty of a collection is to admire a collection. When I'm not admiring it, it's nice to have it on display to allow others to admire it. 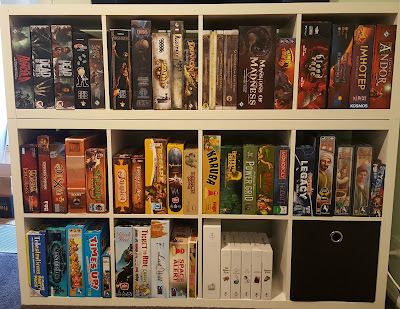 Sometimes if you have no one to play a game with, just looking at the boxes can be enough! Well almost anyway.. I've gone for a two plus one combo as I couldn't fit a four stack under the tv. This has already created issues as I'm out of room! Inside the bottom right box is a bunch of smaller games and for now the rest of the games I couldn't fit have been sent back to the closet. Oh and this isn't a Kallax - there's no Ikea in Tasmania so I've had to resort to the cheaper Bunnings shelves. I don't care, just looking at it makes me happy..